Sometimes as a blogger when I see something that inspires me and gives me a push to try and put my own spin on it whatever way that I can, it can be the motivation that puts you on track. I chose to do that with this current post to honor an idea by my friend, Lucky Spiritor. He has chosen to do what many do and moved on from blogging and the virtual world and it was nice being able to work with him during his re-emergence and it is one thing he definitely has pushed me to find ways to break my own creative limits. We have a similar taste in music most times and when he chose to do a song by Asking Alexandria, who I also listen to quite a bit and have used their work as inspiration, I thought maybe down the road I would try my hand at that particular song as a soundtrack for a post. While I honestly don’t think mine holds much of a candle to his which you can take a look at HERE, I know that I gave it my hardest. A lot of times I know that I kind of go into myself and lock myself away from others because I feel that only I can make a situation that is taxing on me better which is not always the best way to go. That is why I resonate with the part of the song about being locked up in a cage and that’s the visual that I chose to work from and have pulled quite a bit of things together to make it work. The easiest part for me is usually my look and outfit and a lot of that doesn’t change from one post to another save for small details such as hair or facial hair. There are just so many styles out there that it tends to be difficult for me to stick to just one (as well as when one of the brands you blog for specializes in that category). Modulus is participating once again at the equal10 event and their offering for the month of July is a straight side-swept hair called “Jared”. I thought that this worked great for the edgier look that I was going for with the “Spring Bomber” from Gabriel. I’m of course once again wearing one of the black tones from the Monochromes pack which also fits the overall aesthetic of my appearance. I could have probably even worn guyliner with this look but I felt like that would be a bit too much and would take away more than it was adding. This hair was easy to adjust to my super big dome which is one of the things I like about hairs from Modulus as I don’t spend extra setup time trying to fuss with it (as I don’t have to). Available @ equal10 until August 5th! 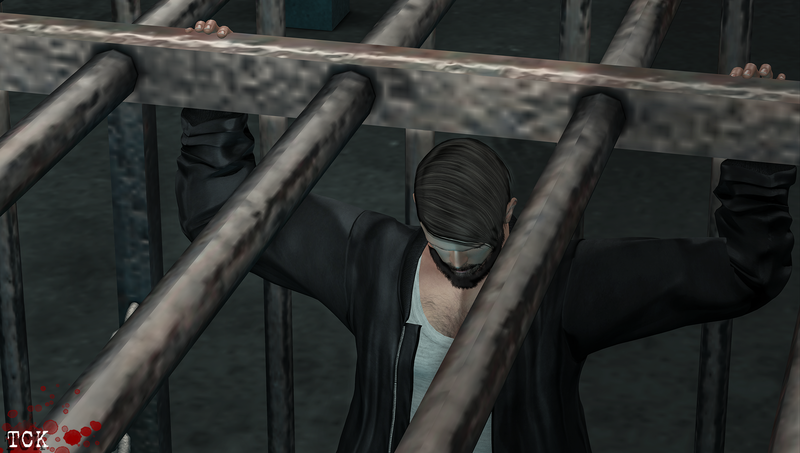 Lately I’ve found myself not really trying out new skins or getting demo’s for them because I’m very happy with the face I’ve been wearing lately but I was intrigued by the [Vendetta] “Nathan” skin from The Men Jail. It also challenged me to switch from my Daniel head to Victor which is what the skin suggested for best use (and after comparing between the two I have to agree). One of the other surprising things is that the skin only comes in “tan” tones which is normally not my particular blend of tea but it is a nice skin so I was very happy to blog it and put it out there for the world to see in conjunction with the Purfect “Beard and Mustache 005”. Earlier I mentioned cages and of course that became a huge centerpiece of my scene which one was easy to find as a part of the goodies from The Men Jail. *BENT* has for sale a very sizeable prison cell that I feel from getting acquainted with it is patterned after something used in the Suicide Squad movie at the beginning and towards the end of the film. It’s construction is nice but the only thing (and it’s not a complaint at all) is that I feel it could have been made to be resized. I wouldn’t call it a deal-breaker or dissuade anyone from getting this because it’s very cool and really helped me with my scene. As I begin to wrap this up I will give a few final thoughts about the overall production of this blog post. I really feel even though it has a bit of a darker tone to it there is also a sense of hope that comes with it because each and every one of us may have that feeling of being in a cage at sometime in our lifetimes but unless you are truly in a cell because of something horrific that’s been done, escape is possible and you don’t always have to rely on yourself. There are people you may have in your life that would give anything they could for you, and there’s even the potential for someone you’ve never met to help raise you from that feeling of being locked up. Freedom is possible and that is something I’ll leave you with until our paths cross again. Next Post [#506] It Finally Happened!